At the heart of modern physics is the atomic hypothesis, the simple notion that the universe is fundamentally granular. Feynman, R.P., Leighton, R.B. and Sands, M. (1964). The Feynman Lectures on Physics. Addison Wesley. p1-2. All things are made of atoms. Tiny particles that humans are unable to directly experience. Although we cannot see, hear, smell or feel individual atoms, there is abundant scientific evidence that they exist. After nearly two hundred years of experimental testing, the atomic hypothesis hasn't been falsified. Informally, many scientists would probably think of the atomic hypothesis as a fact. Still, the idea remains counter intuitive. Matter does not readily reveal it's fundamental granularity. What we actually see and feel everyday is a continuous world. One of the people who took seriously the challenge of experimentally investigating the atomic hypothesis was the French scientist Jean Perrin (1870 – 1942). Perrin studied Brownian motion of minute particles suspended in liquids. His work verified Einstein’s theoretical explanation of this phenomenon. It confirmed the atomic nature of matter and he won the Nobel Prize for Physics in 1926. The figure here reproduced shows three drawings obtained by tracing the segments which join the consecutive positions of the same granules of mastic at intervals of 30 seconds. It is the half of the mean square of such segments which verifies the formula of Einstein. 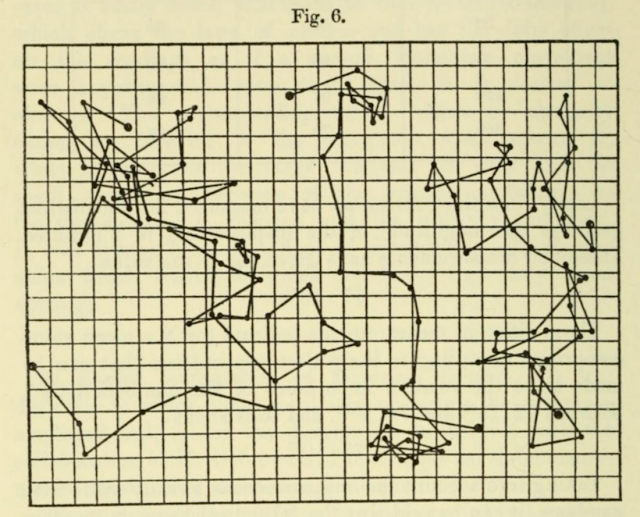 One of these drawings shows 50 consecutive positions of the same granule. They only give a very feeble idea of the prodigiously entangled character of the real trajectory. 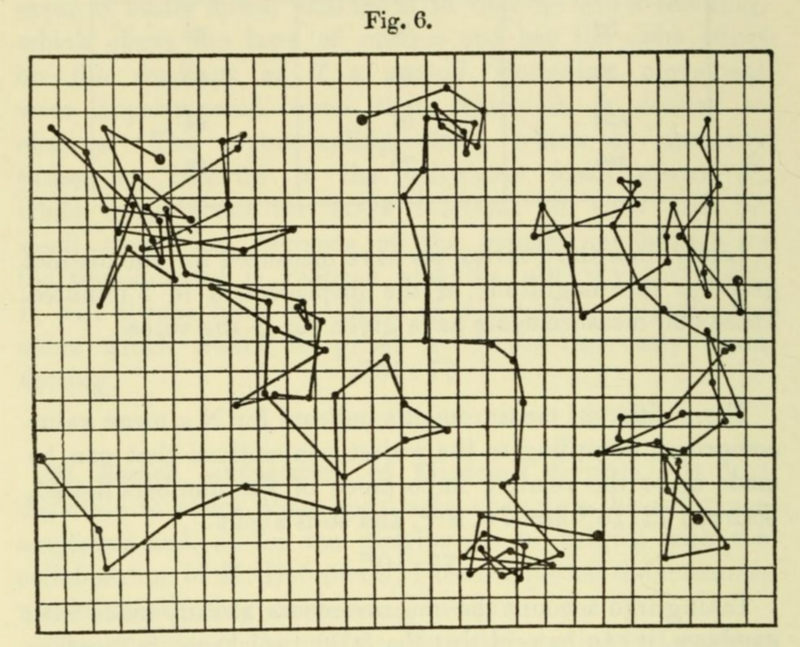 If the positions were indicated second to second, each of these rectilinear segments would be replaced by a polygonal contour of 30 sides, relatively as complicated as the drawing here reproduced, and so on.